This is a Prey locations guide. Here you will find details on the Cargo Bay, including items, weapons, and secrets. This site is barely holding up due to the massive hull breach. It is teeming with Cystoids who have planted their nests. Exterminate them to open a path. By searching the area, you will find the remains of levitating crew members bearing some supplies. Once you enter this area, you will encounter security officer Austin Cool. You will be warned of patrolling Phantoms surrounding the site. It also has a Recycler and Fabricator nearby, however they do not function because the power is off. Appears as hell on earth as the area is reeking of smoke, ashes, and deceased crew members. The fire is too strong that the GLOO Cannon cannot put it out. You need to either use an ability to squeeze through the narrow spaces or tread along the shelves. The area responsible for Cargo Bay A’s power. Be wary of the lurking Greater Mimic. This location is filled with several useful supplies. By the time you have fulfilled the task, Security Officer Austin Cool will inform you of the plan. When you enter this area, you will encounter a wary Sarah Elazar. This area is near the Quartermaster’s Office. Inside are several supplies useful for patching any of your sustained injuries. On your way to this area you will come across some security officers. If you are keeping up wit the objectives you will also find a familiar face. Operating the Utility on the workstation will allow you to release remote containers’ locks. Be cautious of the single Etheric Phantom sneaking in the area. While you’re here, there are some objectives worth checking if you are a keen on finishing them. Found at the Cargo Bay A’s exterior. Frisk Tana Vale’s corpse. Found at Shipping and Receiving. Release the cage locks from the Utilities tab and search Cage 1. Found at the Cargo Bay A’s exterior. Frisk Riley Butler’s corpse. Found at Shipping and Receiving. Release the cage locks from the Utilities tab and search Cage 2. Found (2) at Shipping and Receiving. Release the cage locks from the Utilities tab and search Cage 2. Found in Cargo Bay B. Inspect the red supply crates stored on the shelves. Found in Cargo Bay A. Frisk Jessica Wiley’s corpse. Found in Fuel Storage Bay. Frisk Gerald Wildman’s corpse. Found (2) at the Cargo Bay A’s exterior. Inside the room with Riley Butler’s corpse, examine the nearby safe and use Sarah Elazar’s keycode. Found (4) at the Quartermaster’s Office. Inspect the console close by to find a container. Found in Cargo Bay B. Frisk Christopher Smith’s corpse. Found in Fuel Storage Bay. Examine the red and white supply crates. Found at the Quartermaster’s Office. Inspect the console close by. Found in Fuel Storage Bay. Examine Gus Magill’s corpse. Alternatively, you can discover his note underneath his desk. Found in Shipping and Receiving. 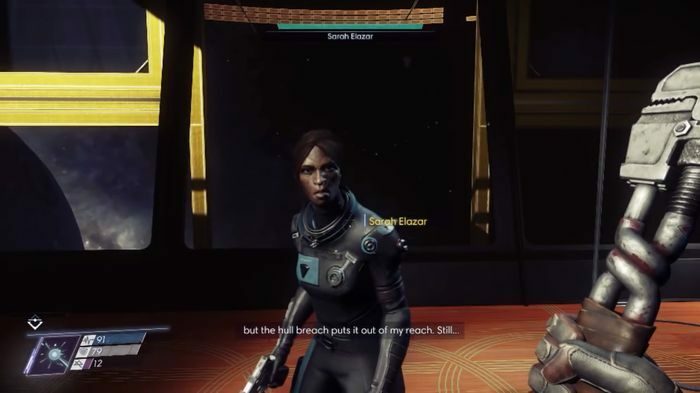 Continue the objective “Cargo Bay Defenses” to receive this from Sarah Elazar. Found in Shipping and Receiving. Loot it from Sarah Elazar’s corpse if she dies. Found a swarm in the Cargo Staging Area. Found a swarm after unlocking Cargo Bay B. Found lurking in the Cargo Power Control. Found in G.U.T.S. Loading Bay.